At Family Ski Trips we are always longing for winter. But summer doesn’t have to be a complete bummer. We find our adrenaline fixes when alpine skiing is on summer hiatus on the water and in the mountains. Biking and hiking and ziplining don’t quite emulate the thrill of schussing downhill. Water skiing does but you need a boat, ski, towline, driver, spotter, fuel and flat water! 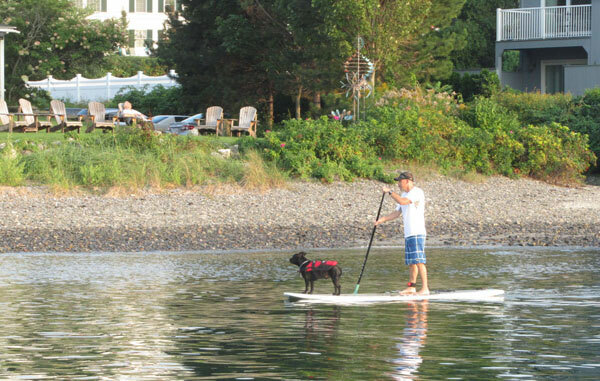 We discovered Stand Up Paddleboarding on the Maine Coast, and found “SUP” to be fun, and pretty simple as a skier. It’s refreshing too if you fall in the freezing salt waters of the Atlantic. Wear your safety leash so you don’t lose your board if (when) you fall off. Much like your ski gear, it is your responsibility to carry and control your board – on land and in water. You must also have a PDF, life jacket, with you. Start small and work your way up on your SUP. Begin on gentle calm water out of the way from any busy boating channels and strong currents. Once you have strong balance and paddling skills to maneuver and turn your board, you can try riding the waves in open water or beach surf.